1/8 Off road, 1/8 On road, 1/8GT. 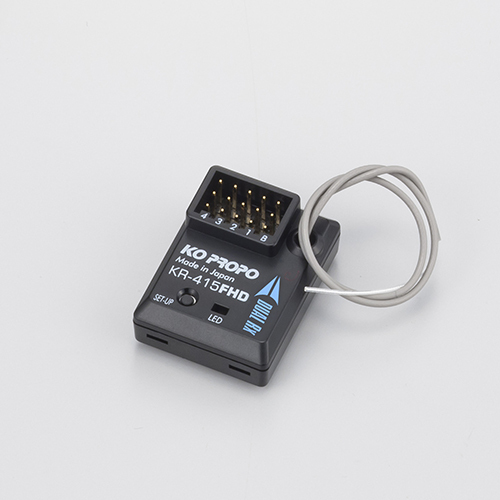 HCS is KO PROPO’s own propiortary high-speed communication system.  The HCS mode shortens communication time of the signal between the receiver to the servo which is compressed up to 1/4 compared to the former system. With HCS, the servo starts moving approximately 1/1000sec quicker. The time may seem very small, but with the operation signal being sent is approximately 300 times in a second, this advantage multiplies resulting in a response and substantially a superior smooth linear driving feel. 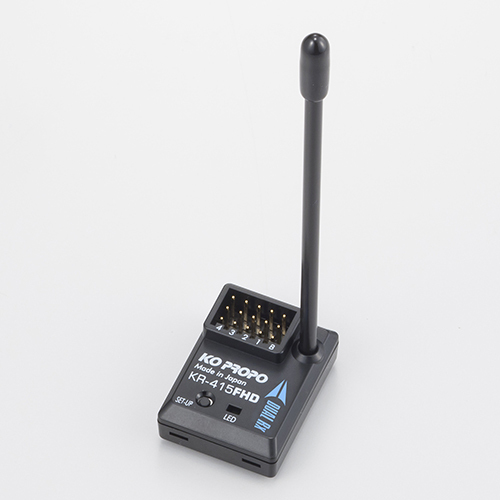 The receiver must receive the signal of data from transmitter without a loss of the signal for HCS effect. So, we developed a new receiver with dual Rx system which has a high quality communication specification.KR-415FHD includes Dual Rx system which is compatible for HCS. If a radio wave drops the other receiver inside is able to reproduce the signal for accuracy to the servo, a KO PROPO unequalled precision. 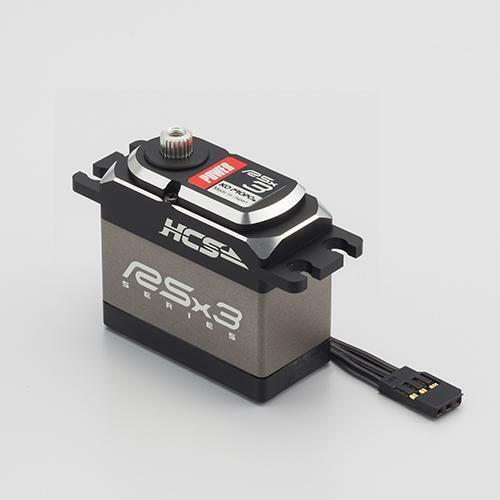 *Corresponding servos are the RSx3/BSx3 series. 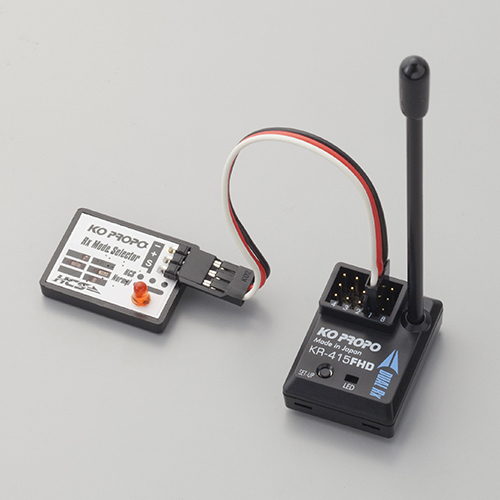 HCS is a compatible system between the receiver and servos. So all of our customer using FHSS transmitters can use HCS. But this true value is used with the EX-RR. Because the EX-RR was developed to have the best steering, throttle and software for use with HCS. Please enjoy the wonderful driving experience while using the HCS. HCS compatible receiver can change a mode to each channel 1-4 indiviually. Changing the mode are very easy with the RX mode selector. Switch off the receiver and connect the mode selector to a channel that you would like changed. While pushing the set button on the receiver, turn the power source ON. When the LED of the mode selector lights up, the change is completed. The correspondence servo recognizes both modes automatically. So you do not change mode operation to the servo. The correspondence servo recognizes both modes automatically. In the case of use with HCS not compatible servo by HCS mode. Servo can not work. Please change mode to normal mode in the receiver. HCS compatible models and related products.